Showcase rustic industrial style with this end table. The mix of iron and acacia veneers creates a distinct industrial feel, while the wood base and Honey finish keep the look warm and rustic. A cross design on the top and base turn this simple end table into a stylish focal point. The Klarissa End Table with Iron Cross Design by Steve Silver at Walker's Furniture in the Spokane, Kennewick, Tri-Cities, Wenatchee, Coeur D’Alene, Yakima, Walla Walla, Umatilla, Moses Lake area. Product availability may vary. Contact us for the most current availability on this product. Case Construction Hardwood solids and acacia veneers with iron accents. This accent table group promises warm tones and visually interesting shapes while touching on rustic industrial style. 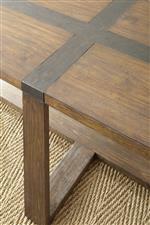 Tables are crafted from hardwood solids and acacia veneers, accented by an iron cross detail on the table tops. The tabletop cross motif extends down into the wood base for a unique silhouette that looks open and clean. A Honey finish completes the look, bringing warm tones into any living room or family room. The Klarissa collection is a great option if you are looking for Rustic Industrial furniture in the Spokane, Kennewick, Tri-Cities, Wenatchee, Coeur D’Alene, Yakima, Walla Walla, Umatilla, Moses Lake area. Browse other items in the Klarissa collection from Walker's Furniture in the Spokane, Kennewick, Tri-Cities, Wenatchee, Coeur D’Alene, Yakima, Walla Walla, Umatilla, Moses Lake area.